One of the biggest concerns for some vacationers in various cities can be the issue of local transportation. Unfamiliarity with the layout of the city and its various hotspots can be daunting for some, especially those who would prefer to use public transport. Luckily for visitors to Niagara Falls, these concerns can be immediately alleviated due to the stellar public transport system that exists in our city. Options are typically available year around that ferry visitors and locals alike to all of the major tourist attractions and to lesser known areas around Niagara Falls. If you’ve been thinking about local transport for your next visit, look no further than this complete run down of all of the options available for you and your family. Operating all year, the WEGO bus system is the best and easiest way to for visitors to access all of the sights and historic attractions throughout the city of Niagara Falls. This comprehensive bus system replaces the Peoplemover busses that many tourists have grown to love, but it offers us a much easier and more integrated way to get around the Canadian side of the falls. Not only does the WEGO bus line offer service to and from all areas near the iconic waterfall but it also serves the area to the west of the falls where many campgrounds and hotels are located. 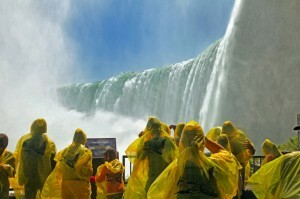 This allows visitors who prefer to stay away from the hustle and bustle of Niagara to access the city when they choose. WEGO Bus also services the bus and train stations which will help you get to your hotel with ease. Twenty-four–hour tickets for the WEGO Bus can be purchased at most hotels. Adult tickets are $7.00, children ages of 6 and 12 are $4.00, and children under 5 years ride for free. For those visitors who would like to explore the areas outside the city of Niagara there are several shuttle-bus options. 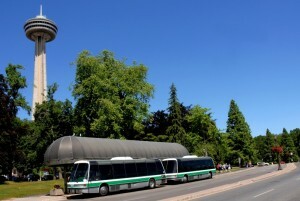 Between May and October a daily shuttle operates between the falls and Niagara on the Lake. Tickets can be purchased at the Floral Clock for the outbound trip, or at Fort George for the return trip. Tickets are $10.00 round trip for adults and $6.00 round trip for children between the ages of 6 and 12. Again, children younger than 5 are free. , there is a fantastic shuttle that operates between June 21 and August 31. Departing from Table Rock the shuttle passes by some of the most historic parts of the area and a guide is on board to provide interesting commentary about the region. This shuttle is particularly popular with cyclists, as they can bring their bikes on the bus and ride back. Advanced reservations are required for this shuttle, and the price is $5.00 one way or $10.00 round trip. Shuttle tickets do not include the entrance fee for Fort Erie. For quick transport around the city of Niagara nothing beats our fleet of friendly and efficient taxis. Cabs can be hailed from almost anywhere, hotel concierge can easily phone one to meet you, or you can book online. The drivers are knowledgeable and always willing to offer sightseeing advice, and taxis accept credit and debit cards for payment. When you visit Niagara with your family the last thing you want to think about is how you’ll get around to all of the amazing sights and activities. Now you can relax and really enjoy your stay because we’ve got the transportation all worked out.